Airborne particles known as "aerosols" strongly impact the way clouds form and change, but accurately capturing this effect in computer climate models has proved to be notoriously difficult. A new study in the Proceedings on the National Academy of Sciences Early Edition online Feb. 26 suggests why—either the models are failing to capture in sufficient detail the processes at work in clouds, or aerosols are now so pervasive in the atmosphere thanks to modern-day pollution that their specific effects on clouds are hard to pin down. A key problem is that we generally do not have data on clouds from the preindustrial era, before there was pollution, for comparison with the clouds of today. Because clouds are a key part of Earth's climate system, working out how they behaved before the Industrial Age might ultimately help us better determine how much the world will eventually warm up. The study points to at least two ways to potentially improve how the clouds are simulated in climate models. One is to better differentiate cloud types in models to account for their variability. Another would be to study clouds that are not influenced by the pollution that humans have been putting out since the Industrial Age started. 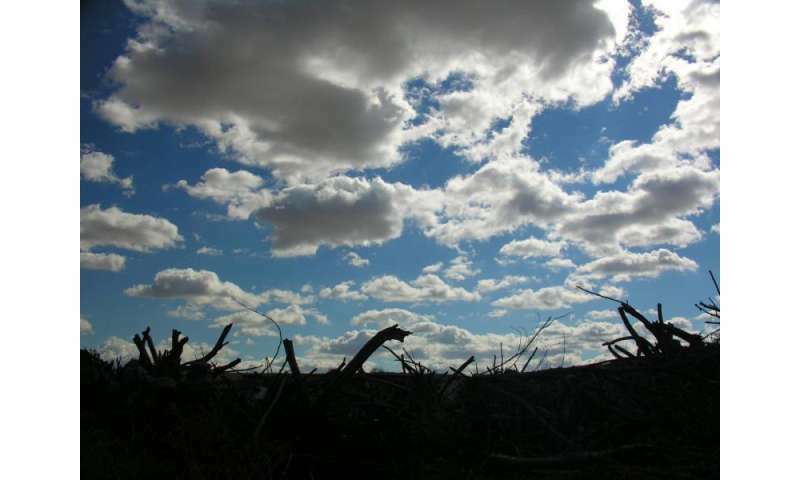 "We might have to find clouds far away from civilization," said study author Steve Ghan of the Department of Energy's Pacific Northwest National Laboratory. "But, there are parts of the world that are pretty darn clean." One of the toughest questions dogging climate scientists is how much the earth will warm from all the greenhouse gases humans are putting into the atmosphere. Computer models put out a range of possibilities, and the smaller the range, the more sure scientists can be of the result. For example, scientists use models to calculate a property called climate sensitivity—or how easy it is to warm the earth with additional greenhouse gases. Ultimately, climate sensitivity will tell us the temperature we will end up at so we don't have to wait until the earth adjusts to the added gases, allowing us to prepare for or impede climate change. Conceptually, climate sensitivity would be straightforward to estimate if one focused on just a few limited components of the Earth system—namely, greenhouse gases in the atmosphere, sunlight hitting the earth, and Earth bouncing some of the sunlight back to space. Under this greatly simplified model, scientists could be pretty confident in their climate sensitivity value: the earth will most likely warm about three-fourths of a degree Celsius for every unit of the sun's energy trapped in the atmosphere, with a possible range of a quarter of a degree more or less. But the sunlight bouncing off the Earth's atmosphere is complicated by the presence of clouds that change in ways that are poorly understood. Climate scientists want to incorporate all the pieces that make up the earth system to nail down a value for overall climate sensitivity. For their part, Ghan and colleagues have been exploring the contribution of clouds and the tiny aerosol particles that influence cloud properties. "It's not enough to have particle emissions and solar energy balance alone because a lot is going on in between," said Ghan. Currently, when scientists use models to calculate the extent to which aerosols—through clouds—affect the earth's climate, they get a much, much wider range and greater uncertainty than for greenhouse gases. Why? Clouds are complex—their properties are influenced by tiny aerosol particles called cloud condensation nuclei that cloud droplets form around; a greater number of particles leads to more cloud droplets which in turn affects the cloud brightness and lifetime, since small cloud droplets hang around for hours, and larger water droplets are more prone to come down as rain, if they're heavy enough. The physics and chemistry underlying these and other components mean scientists have to represent daunting complexity in models. Also, clouds are ephemeral creatures. The measurements of clouds that scientists now take have no counterpart in the geologic record, unlike greenhouse gases that are preserved in bubbles in ice cores. Between ice cores, rocks, trees, and fossils, researchers have a good idea how much carbon dioxide existed in the pre-industrial atmosphere. But they can't tell how often dinosaurs cavorted under cloudy skies. To see how well cloud and aerosol measurements are represented in models, Ghan and colleagues compared different models to each other and to measurements and examined how they re-created the past and present. They did this by essentially taking apart the simulations and testing the pieces. A climate model is like a train barreling through a tunnel—scientists put data on the train at one end and the train delivers a view of the climate out the other. In a perfect world, the simulated climate would take a smooth ride through that tunnel. But it's possible that a rollercoaster resides within, taking the simulation through twists and turns that don't resemble reality. To compare the different models, the team looked at the rides taken by the individual components of the equations that make up the simulations. The relationship between the pre-industrial and present day values of any given component, say, the changes in the concentrations of cloud droplets resulting from a change in aerosols, should be the same across the nine different computer models they tested and should be reflected in data from observations. The team found, however, that pre- and post-industrial values didn't agree, and in some cases the there was even a difference in sign (that is, one model yielded a positive value while another yielded a negative one). That indicated they could not model pre-industrial clouds using measurements that have been collected in a post-industrial world. "It's very curious. With greenhouse gases, climate sensitivity doesn't change over eight hundred thousand years. It works. Why don't clouds?" Ghan said. Additional research is needed to figure out why pre-industrial clouds differ from today's clouds. But Ghan said there are several potential directions to go. One, clouds may be more complex than currently represented in models. For example, clouds could have layers that scientists haven't accounted for in models that complicate the transfer of sunlight in and out of the system. In this case, old and present-day clouds would actually be the same, but it would mean the models are missing essential complexity needed to simulate how aerosols and clouds interact. Two, today's clouds in regions of the world where observations are made are never as clean as they were in pre-industrial times. "Present day variability doesn't apply to pre-industrial times because everything's different now that we've been putting greenhouse gases and pollutants in the air for so long," said Ghan. Scientists can explore this option by studying clouds in pristine regions of the world, such as in the southern hemisphere between the latitudes of 40 and 50 degrees. A third explanation could be that the equations used to represent the cloud-aerosol interaction aren't quite right and need to be revisited. In the future, distinguishing between these options may help scientists shine light on cloud modeling's cloudy history.